Lafayette police Officer Amanda William- son is more than aware of the national spotlight on school safety. But as she patrols the halls at Jefferson High School, it’s not guns or extreme violence she expects to see. In fact, the only tool on her belt she has used in a school is handcuffs. Williamson is one of 19 officers who will become part-time employees of Lafayette School Corp. at the next school board meeting on Monday. In the aftermath of the Sandy Hook school shooting in December, LSC is considering stationing off-duty police officers at all seven elementary schools. The district already positions armed officers at Jefferson High School, Tecumseh Jr. High School and Sunnyside Middle School. Assistant Superintendent John Layton would like to see an officer at the front door of every school building. LSC is reviewing its security policy. Layton declined to comment on specifics but said corporation officials are meeting with school administrators, fire departments and police departments to discuss steps that might be taken. Amanda Marshall, the guardian of a kindergartener at Murdock Elementary, thinks the school is safe and doesn’t want to see armed police officers there. Andrea Boyer, who works at and sends her two sons to Sunnyside Middle School, said she would prefer different methods of security. Police officers began protecting LSC parking lots in the mid-’80s. In 1995, they moved into buildings. Today, there are typically six police officers on duty, primarily at Jefferson, Tecumseh and Sunnyside. The officer at Sunnyside spends part of his day checking on the corporation’s alter- native schools. Aside from officers, LSC policies help secure every building. Doors remain locked at all times. Visitors must be buzzed into the building by an office worker. Every school has multiple security cameras. Jefferson has 250. If there is a threat of gun violence, LSC policy is to instantly go into lockdown. Hallways are cleared, classroom doors are shut, windows are covered and students are moved into one section of the room. There are no color codes or cryptic warning signs; lockdown is the first and only option. Officer Perry Amos has been working at Jefferson High School since 1992. During those 21 years, he has removed guns from students four times. One of those incidents occurred when a student brought a loaded handgun to school with the intention of killing his ex-girlfriend. The girl reported to the in-school officers that the student was trying to get her alone. The officers apprehended the armed student before any violence occurred. Despite the raging national debate on school safety following high-profile shootings, the current in-school officers spend most of their time on basic student punishment is- sues. 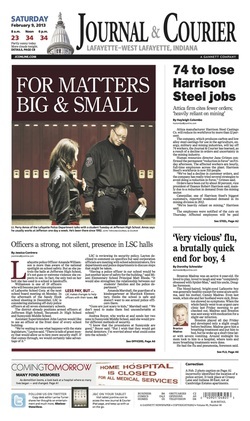 It’s not to say that drug use, fights and serious offenses don’t occur in LSC schools. In-school officers wear bulletproof vests and are armed with a gun, a Taser and pepper spray. But lost cellphones, arguments between friends, dress code violations and skipped classes are much more commonplace offenses that officers like Williamson deal with. She spends most of her day walking the halls, checking bathrooms and talking with students. In many ways, in-school officers have taken it upon themselves to deal with smaller punishment and safety issues so administrators don’t have to. They process disciplinary referrals, talk on the phone with concerned parents and have conferences with disobedient students. “With the changes in how they have to process teacher evaluations, this year (the administration) was dumped with so much stuff to do. It cut their time to work with the kids in half,” said McIver. As a full-time resource officer, McIver is trained and certified to counsel students and educate employees on safety issues. If LSC decides to place officers at elementary schools, those officers would certainly deal with fewer disciplinary mat- ters. But that doesn’t mean they wouldn’t be useful, Earhart Elementary Principal Greg Louk said.